By Vera Tweed Face today's unique health challenges and take charge of your well-being—naturally. 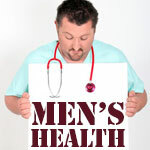 Health concerns for men are changing. While heart disease remains the top killer, thyroid and testosterone levels are being negatively affected by environmental toxins, leading to a host of new symptoms, such as fatigue, depression, low libido, and erectile dysfunction. While not immediately life-threatening, these symptoms reduce quality of life and increase risk for weight gain, heart disease, strokes, diabetes, and premature aging. Holtorf recommends avoiding beverages in plastic bottles, eating organic food, and using toxin-free grooming and household products. In addition, key supplements can mitigate toxins. Fish oil and vitamin D are basics, says Holtorf. For “slow metabolism” that results from toxin-inhibited thyroid function, he recommends Coleus forskohlii. And to prevent overstimulation of the prostrate by testosterone, take the nutrient I3C (indole-3-carbinol). Toxins cause testosterone to be converted into estrogen, reducing “manliness,” and I3C reverses this process. Also found in cruciferous vegetables, I3C is converted in our bodies into DIM (diindolylmethane). “Erectile dysfunction is the tip of an iceberg,” says Stephen Sinatra, MD, an integrative cardiologist and author of The Sinatra Solution. As a marker of heart health, he says, “It’s as significant as high blood pressure or cholesterol.” And it should be addressed as a sign that it’s time to make changes to improve overall health or get a thorough physical rather than a blue pill. For any man who is overweight, losing a few pounds is vital. “If waist size goes up,” he says, “there should be a lightbulb going on in a man’s head.” Restrict sugar (including sodas); eat regular meals of lean protein, plenty of vegetables (especially cruciferous ones) and fruits. Sinatra also recommends drinking organic green tea to keep metabolism humming and ginger tea to prevent fluid retention. And take what he calls the “awesome foursome” supplements for a healthy heart: CoQ10, acetyl-L-carnitine, ribose, and magnesium. In addition to walking or other aerobic exercise, strength training and exercises that improve flexibility are equally important. Pilates and yoga, done correctly, can reduce stress, stretch joints and muscles, and improve balance. “A lot of men have been athletes and might start too fast and injure themselves,” says Tony Victory, a Los Angeles—based fitness trainer. As a first step, practice proper form. Victory recommends starting with a weight that allows you to do a set of 15 repetitions, but not more, and working all the major muscle groups. Once you’ve mastered form, increase the weight so that you can do no more than 10 to 12 repetitions of each exercise per set. Strength train three times a week, and do three sets of each exercise. Within a month, “You’ll feel more alive and awake,” says Victory.